It is no secret that Fiji is one of the most beautiful locations in the world. It is among the first countries to seize the day, so to speak, since it is the one that is ahead of most of us. It relies on tourism since it is the backbone of its economy, but it cannot possibly disappoint. There are 322 islands in the region, but over a hundred are uninhabited. The beaches are pristine, and you can do all kinds of water sports. You can skydive, kayak, and anything else you can think of. But the land offers some attractions as well. You cannot leave Fiji without visiting the Garden of the Sleeping Giant, which is a botanical garden filled with orchids and other species of flowers. Needless to say, your vacation in Fiji will be one to remember. Before you start packing for Fiji, you need to make sure that you do not need a visa. There are 107 countries and jurisdictions whose citizens are not required to obtain a visa for Fiji. 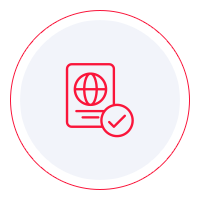 Visas on arrival are not available, and neither are electronic visas. As a result, all the nationalities that are not visa exempt must pay a visit to the nearest Fijian embassy and apply for a visa there. If you want to find out whether or not you need a visa for Fiji, you can use iVisa’s Visa Checker. As opposed to going through Fiji’s visa policy. All you are required to do is select your nationality from the drag-down menu and put Fiji as your destination. If you do not need a visa, you start planning the itinerary. If you do, you will be given a list of the embassies you can use to apply. It is as simple as that. Since the government of Fiji has not adopted the electronic visa system, we cannot process visa applications. Although we hope that that will change shortly. Nevertheless, we like to be of assistance, which is why our support service is at your disposal. We do not charge for support, and you can call 24/7. Before going to the Fijian embassy to submit your visa application, you should do your homework on the requirements. After all, you need to know whether or not you can meet them. Although can do that online, we recommend that you call the embassy itself. It is the most reliable source of information. Websites are not always up to date, and that can lead to errors. Just give the embassy a call, and you will find out what you need to know. Nevertheless, what we can tell you is that you need a passport that is valid and remains as such for at least another 6 months from the date of arrival in Fiji. For further information, contact the nearest embassy of Fiji. We regret that we cannot help you more with the visa application process for Fiji, but we hope that the information above is enough for now. Do not hesitate to contact us if you have more questions.